Our server is still having issues with performance, and that's our top priority to fix as of right now. Contact someone that has experience tracking down such issues to try to help us and fix it. 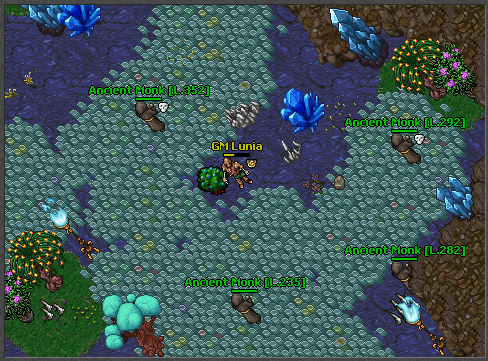 We also increased the servers CPU and RAM today, while it won't fix the issue, it will take longer for the lagg appear. We might implement an auto restarter as a temporary fix, it will restart the server automatically once it starts to lagg. We also added a test server, there we can see if the issue still happens if there's few players online, and we can disable certain features to see if the lagg still exists, but testing all those scenarios will take a long time. Today there most likely won't be a patch, but we did a couple of adjustments that are already implemented ingame to how potions scales by level, ultimate spirit potion should now heal more mana, and gives abit more per level. -Exit logged characters no longer gain tokens. -You can have a maximum of 4 characters logged in per ip.